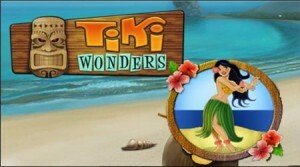 Net Entertainment’s Tiki Wonders slot game now has a progressive jackpot of over €2.1 million up for grabs! Tiki Wonders is a 5 reel, 30 payline slot game built on an island theme. The symbols include toucans, dolphins, turtles and surfers as well as hula girls, pineapple cocktails and iguanas. There are actually two progressive jackpots up for grabs, the wonder jackpot and the mega jackpot. To win you need to spin four or five star icons on a payline, the mega jackpot is won with five stars. The Surfer is the wild symbol, spinning five wilds on a payline pays out a massive 10,000 coin prize. The hula girl is the scatter symbol, if you spin 2 of her then you receive a multiplier on your bet and three or more hula girls awards up to 30 free spins. Over all there are loads of ways to win in this great slot game and best of all, the progressive jackpots can be hit without placing the maximum bet. This means that whatever your betting budget, you have a great chance of a massive payout.